Storyboards, miniature “practice” books (a.k.a “dummy” books), and final art. Using colored pencils, watercolor paint, cut-outs, collages, and/or real objects in art. Artists research the animals or settings they want to draw by checking out books from the library and using video or digital cameras to take pictures. I also shared different drafts of my drawings. Students saw firsthand that sometimes shapes and colors do not look right the first time I draw it. I draw and redraw the pictures then I test each picture on my audience, both children and adults. If my audience does not understand the picture, I draw it again. Practice, practice, practice! 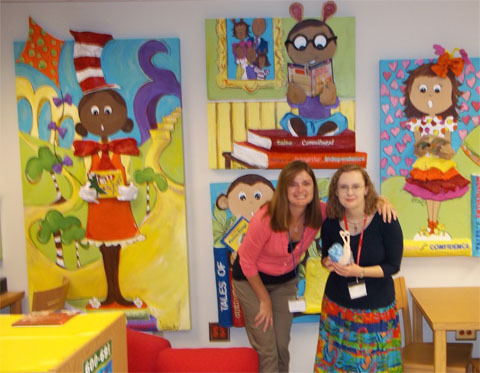 Ms. Webb (pictured left) in front of the beautiful murals in the Jackson Primary Library. 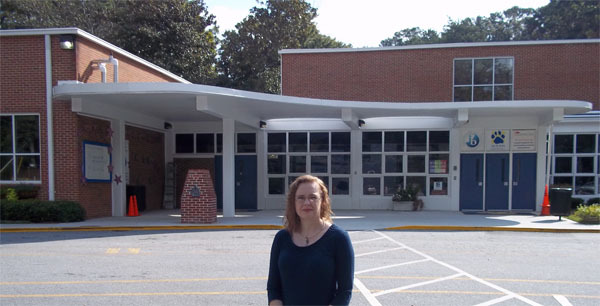 Many thanks to the librarian, Teresa Webb, for investing so much time preparing the students for my visit. Ms. Webb read Tiny Snail, Polliwog, and Sea Horse, run! to the children. Thank you Jackson Primary PTA for inviting me to your school! Reading, walking my dogs, and writing historical novels for teens and adults. I don't have a novel published yet. I'll let you know when I do!